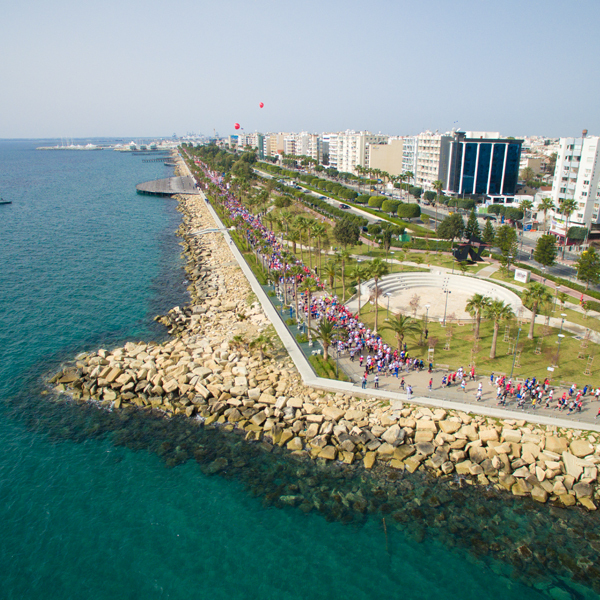 OPAP Limassol Marathon GSO is the largest sports event in Cyprus and its stunning natural location is instantly impressive. With a flat, fast and straight course stretching 21km along Cyprus’ beautiful Mediterranean coastline, and a maximum altitude of 18m, runners have a real chance of achieving a PB as they enjoy the spectacular views and refreshing sea breeze. Early spring warmth, ancient ruins and delicious, healthy food complete the setting. The OPAP Limassol Marathon GSO is quite unique in that it offers a number of different races on race day. In addition to the full marathon, there is a Half Marathon, a 10K Energy Race, a 5K City Race, a 5K Corporate Team Race and a 1K Kids Race. Together these races offer a complete sporting experience for all ages and abilities, which is very much embraced by the thousands of participants and spectators who come to the start line to cheer the participants on. Overseas visitors can expect a friendly and celebratory atmosphere in a beautiful seaside location, as well as the highest international running standards. The OPAP Limassol Marathon GSO route is not a difficult one. Consisting of a flat route with the longest distance traveled along the coastal road of Limassol. 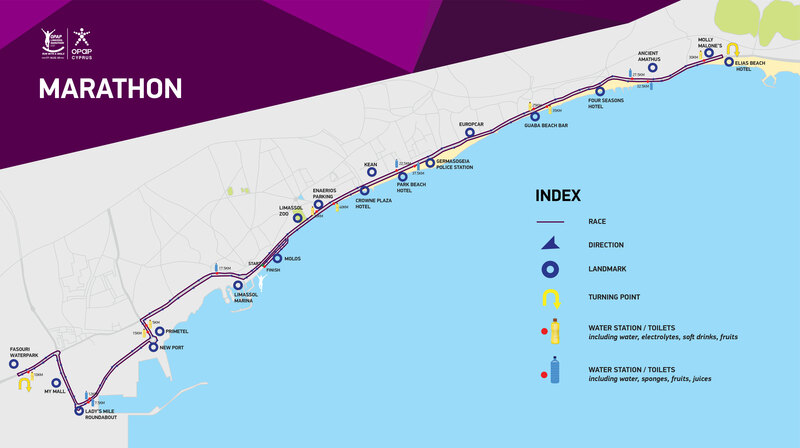 The start of the Marathon is on the Limassol Molos and goes along towards the end of seafront, where the athletes turn, and the route continues in a westerly direction. From the Old Port Roundabout, the participants run along Kioproulouzate Street and continue along Franklin Roosevelt, heading towards the New Port Roundabout, where they turn and continue east. The route follows Franklin Roosevelt again, passing the church of St. Thekla and continues onto Spyros Araouzou, the coastal road of Limassol. 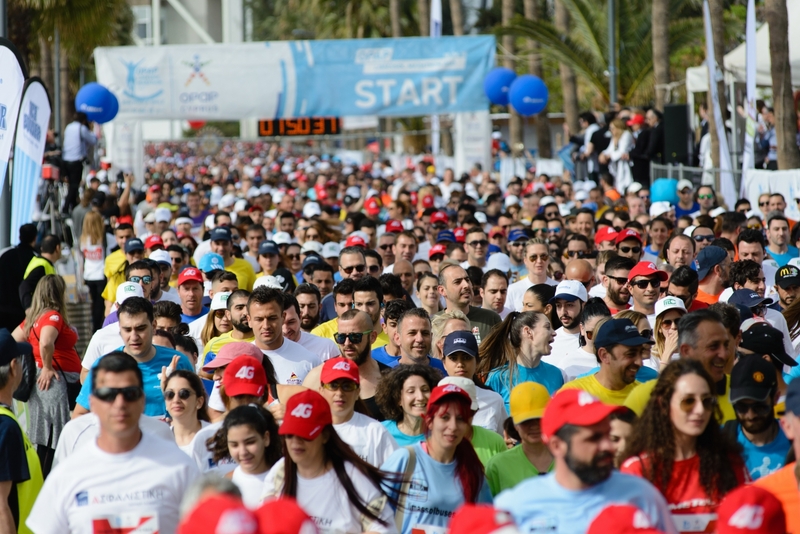 Runners will go east, towards the ancient ruins at Amathus, following a coastal route through the municipalities of Limassol, Agios Athanasios and Germasogeia. At the 22nd km of the route, the path turns and the journey continues again in a westerly direction along the coastal road. At the focal point of Georgios Grivas Digenis street is a 180 degree turn onto Prophet Elias Street, where athletes turn again, this time towards the end of the route on the Limassol Molos.